HP 458491-001 PCI-Express Modem kopen? | That's IT! Professionele, voor HP door Intel geproduceerde PCI-Express x4 2-kanaals server-netwerkadapter. Gebruikt maar in absolute nieuwstaat. Wordt bulk in antistatische verpakking geleverd. 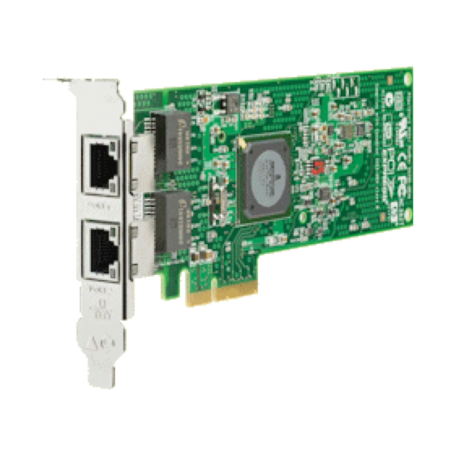 HP NC382T is a high performance PCI Express (PCIe) Dual Port, copper, multifunction Gigabit Server Adapter for the discerning ProLiant customer used to optimum performance. It is the latest addition to the best selling line of HP dual port NICs, which enable customers to save valuable I/O slots. It makes use of the latest Broadcom 5709 silicon and is suitable for both standard and low profile slots. It will be a supported option on most ProLiant DL and ML servers at a highly competitive price. Being a multifunction NIC it supports TOE (TCP/IP Offload Engine) for Windows and Internet Small Computer System Interface (iSCSI). Besides this it is also laden with features that ProLiant customers have come to expect like support for failover and load balancing, Wake on LAN, Pre-Boot Execution Environment (PXE), large send offload capability, multiple VLAN tagging, and auto-negotiated 10/100/1000Mbps Ethernet speeds.